Located at 1164 Bladensburg Road, N.E., The property will feature 65 long term affordable apartments, ample community space including a wellness center, fitness room in addition to 13 Permanent Supportive Housing units, with services provided by Community Connections. The community will be 100% age restricted to households aged 55 years and older. Each apartment will be leased to households earning less than 50% of the Area Median Income. 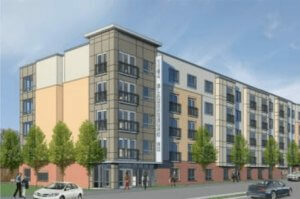 Development team members include Neighborhood Development Company, Hamel Builders Inc., and Grimm + Parker Architects.